Aspen’s ES-Series (Equipment Series) are equipment/machinery hauling trailers which primarily serve the construction industry. 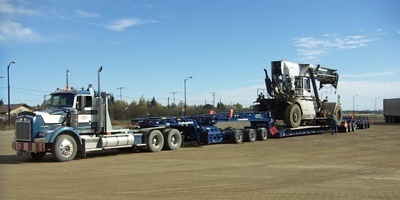 Payloads of these trailers are 85 tons, with axle configurations of 10 through 13 axles (including truck axles). Aspen ES-Series trailers feature mechanical removable necks with a tower jeep or hydraulic removable necks with double drop, square tail frames. 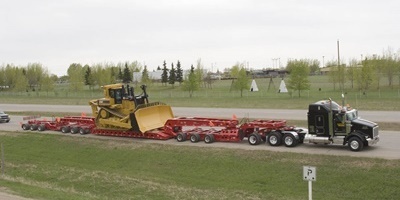 ES-Series trailers can be configured with a variety of components including various deck widths and lengths including custom options. The ES-Series trailers have common air/regulated air suspensions or walking beam (trunnion) suspensions with transporter equalization achieved by a mechanical equalizing inner frame “Cali-Legal” or “West Coast” design. Aspen’s ES-Series of trailers are available in specific regional configurations (Interstate – US and Canada, US North West and California) to maximize trailer configurations for specific regional regulations. Experienced Design … Aspen’s ES-Series is meticulously designed by Aspen engineers with over 240 years of combined trailer engineering knowledge. Not only is engineering knowledge important, but the combination of specific trailer industry experience and mechanical engineering knowledge makes our product one of the best trailer brands in the industry. Aspen’s ES-Series was designed from the load down to maximize payload capacity and minimize tare weight. The ES-Series takes advantage of Aspen’s “flex frame” design which allows the frame to flex in all of the right places to allow frame deflection without breaking in key areas of the trailer. “Easy to pull” … is one of the things we hear from our customers time after time. 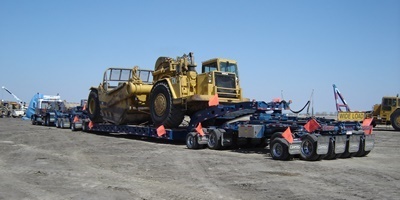 Aspen takes care to design and build its trailers so that they are easy to operate and maintain with operator ease as one of our cornerstones of design. Aspen’s unique mechanical steering linkage ensures your trailer will steer positively and track correctly making sure you are confident that the load is where it’s supposed to be. Aspen’s proprietary adjustable, hydraulic connect/disconnect compensator ensures that the automatic steering is easy to use trouble free for reliable operation and easy hook up and disconnect when you have to manually steer through those challenging corners. Aspen’s industry leading steering system has progressive steering ratios, off-tracking adjustment and steering speed adjustment to ensure your trailer is always where it’s supposed to be for trouble free, confident travel so that you can Haul More.